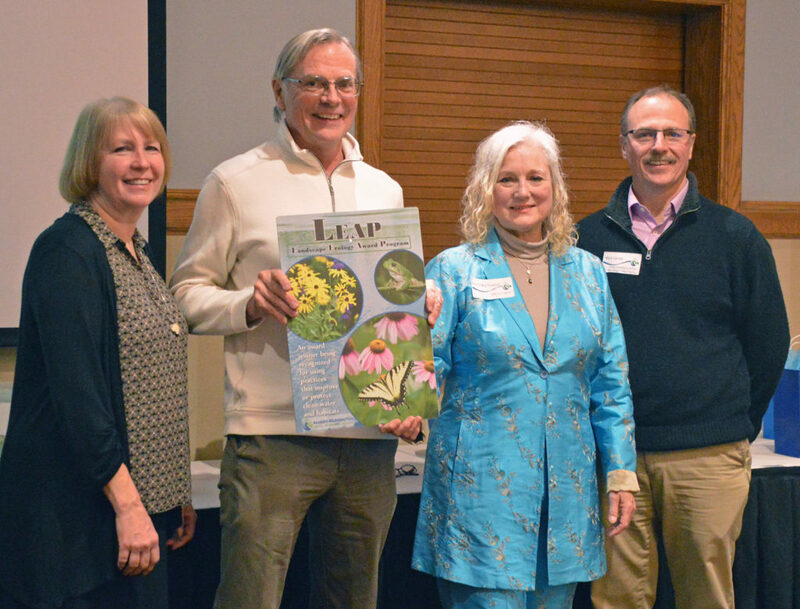 This year’s Landscape Ecology Awards Program (LEAP) recognized four homes in Saint Paul and Maplewood for exceptional landscaping practices that benefit water quality and natural resources. The owners of each property received awards during our annual recognition dinner, held Nov. 14 at Keller Golf Course. The District’s citizen-volunteer LEAP Team manages this program, visits nominated sites and conducts judging. Since 2002, the program has awarded 102 sites including 74 private residences, five schools, seven businesses, five churches and 11 public properties. Each of these award-winning properties feature Minnesota native plants, which provide important habitat for pollinators and other wildlife. Plus, the use of rain gardens and deep-rooted vegetation helps water infiltrate the soil instead of running off into lakes and streams. 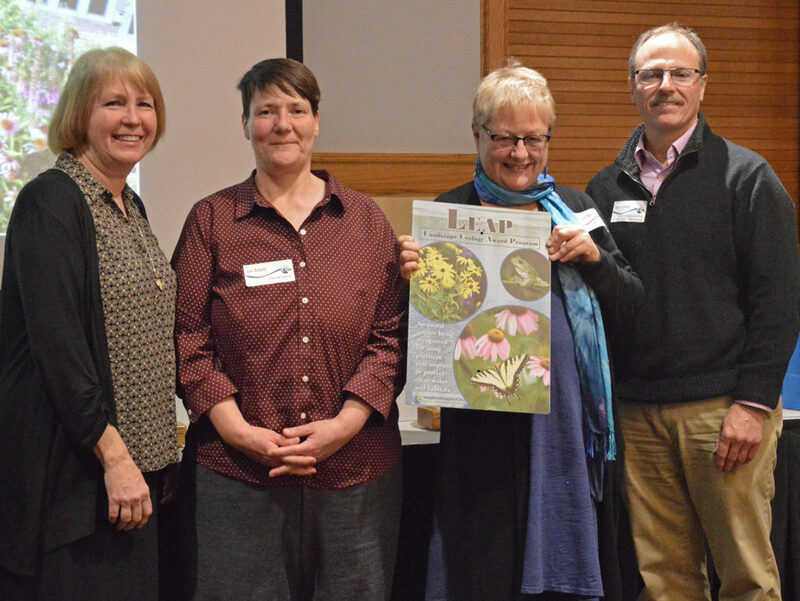 We congratulate the 2018 LEAP winners who set a great example of how landscaping decisions made at home can have a positive impact on the watershed! 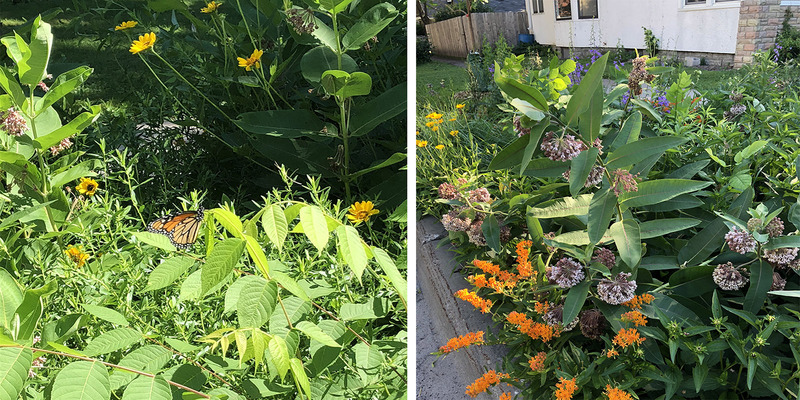 Jan Arleth and KateLynn Hibbard began replacing their lawn with native plants about seven years ago, and the result is a lush landscape that’s great for pollinators and requires little watering. About 80 percent of the plantings are “native Lake Phalen” plants, and a rain barrel adds to the conservation ethic on display at this Saint Paul home. Jan and KateLynn are not only helping the environment, they are also helping to increase neighborhood awareness around the impact of landscaping choices. L-R: Presenter Dana Larsen-Ramsay, LEAP Award recipients Jan Arleth and Kate Lynn Hibbard, and presenter Mark Gernes. 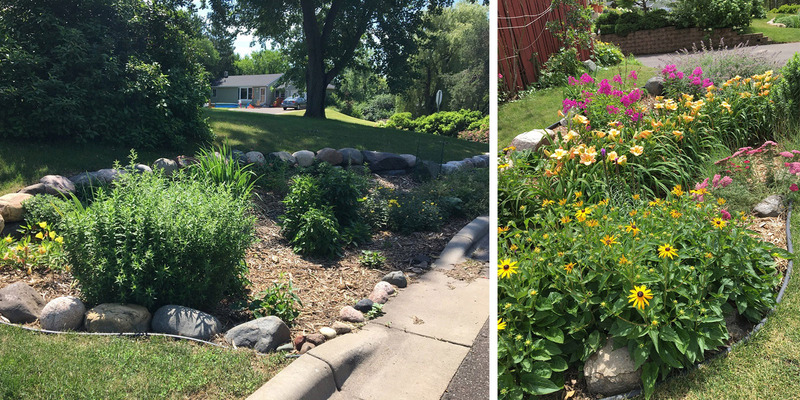 With a steeply sloping yard overlooking the east shore of Lake Phalen, Rosemary Slowiak and Bill Zajicek have gone to great lengths to prevent runoff and protect their local watershed. 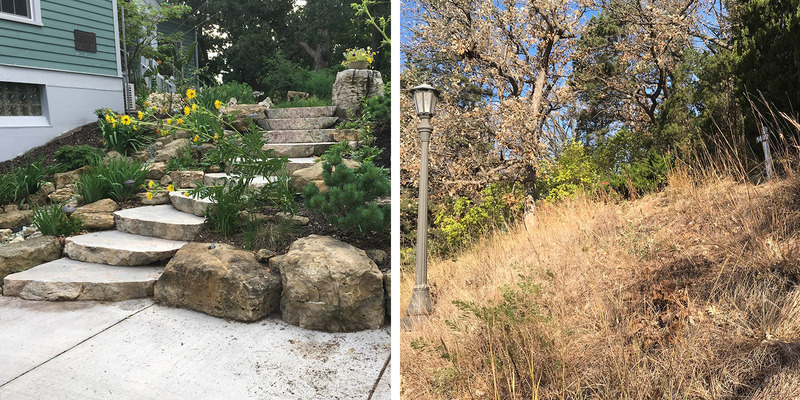 Innovative water management practices on their property include restored prairie, a dry creek-bed channel, rain garden to collect driveway runoff, and grass-pave sidewalk. By incorporating native plants into formal landscaping features, they have created a yard that is both beautiful and ecologically sound. L-R: Presenter Dana Larsen-Ramsay, LEAP Award recipients William Zajicek and Rosemary Slowiak, and presenter Mark Gernes. Candyce Osterkampe’s entire yard features a wealth of diversity from native plants to organic vegetable gardens. A rain garden on the east side of the property filters runoff and contains pollinator friendly wildflowers like purple coneflower. This welcoming, manicured site is testament to lots of hard work since Candyce began converting the lawn to gardens 10 years ago. 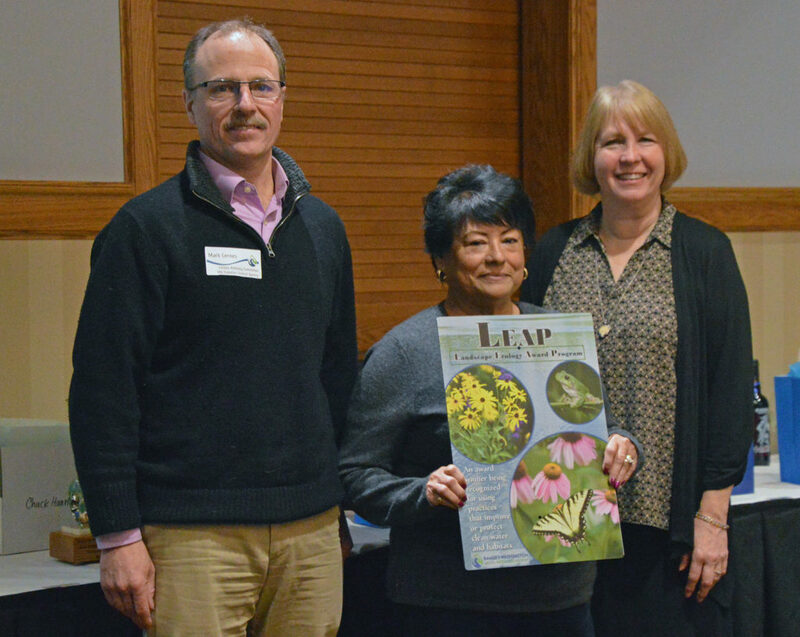 Monica and Terrance Garrity received a Landscape Ecology Awards Program (LEAP) award for their care in maintaining three large rain gardens installed at their home by the City of Maplewood. 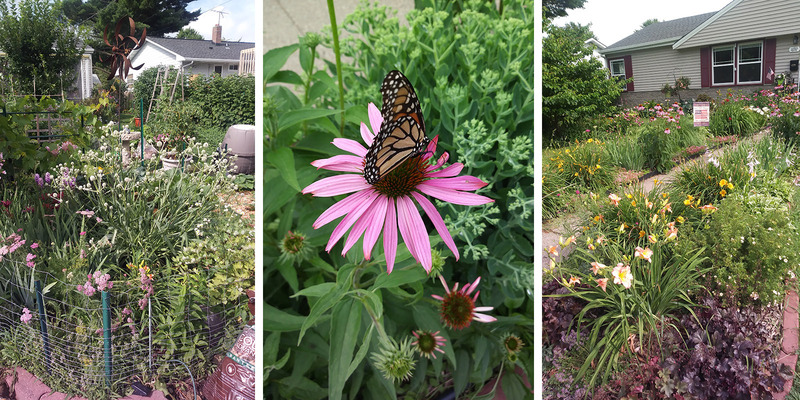 The rain gardens capture stormwater runoff from their roof and the street, and feature variety of flowering plants that provide great habitat for pollinators. Before the project, storms would cause large puddles to form in the driveway, backyard and neighbor’s yard. Now, the puddles are gone as water is directed to the rain gardens where it can soak into the ground. L-R: Presenter Mark Gernes, LEAP Award recipient Monica Garrity and presenter Dana Larsen-Ramsay.